CHICAGO — Heaven and hell will come together on the steps of the Field Museum June 24. Marco Nereo Rotelli will combine poetry and light for "Divina Natura," an installation at the Field Museum. The installation is inspired by Dante Alighieri's "Divine Comedy," which chronicles the author's trips through heaven, hell and purgatory. 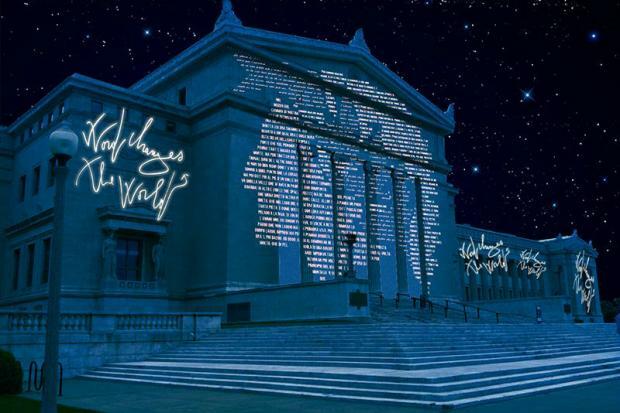 The installation will be on display for only one night, and it won't be a typical light show: Poets from across the world will read a poem — once in their native tongues and again in English — as Rotelli's words and symbols are displayed across the museum's exterior. "The idea is that the museum will be a page of a poem," Rotelli said. Rotelli also hopes to build a bridge between the past and present through his work. The artist, who said he had visited but not worked in Chicago prior to the Field Museum installation, was inspired by Dante's work because of the way it connected with everyday people through language and symbolism. "I want to pay a homage to the contemporary and history, make [Divine Comedy] universal," Rotelli said. To share that inspiration, Rotelli gave the poets a specific canto from the "Divine Comedy" to read and work with. Arica Hilton, who curated the poetry portion of the installation and will present a Canto XXXIII-inspired poem, helped Rotelli select the participating artists. Hilton had previously worked with Rotelli at Northwestern University, where he was an artist in residence. There, Rotelli created a nature-inspired installation that was displayed against the walls of the Deering Library while Hilton and other poets shared their work inside the library. "He's giving the backdrop, and he's giving the entire stage for the poets," Hilton said. "It's an installation of poetry and music, light and art." Rotelli said poets are the only people who have "a free voice," and masters of the art "feel the truth." The installation will also feature music from Thomas Masters, Adrian Leverkuhn and soprano Karolina Dvorakova. "Divina Natura" is part of the Year of Italian Culture, during which the United States is celebrating the culture of Italy. Silvio Marchetti, director of Chicago's Istituto Italiano di Cultura, said there will be about 200 related cultural events throughout the United States. Among other things, Chicago will see concerts, plays and its first exhibition of Judith Slaying Holofernes, a famous Renaissance-era painting, from Oct. 17 to Jan. 9. Why Are Spiders Spinning Webs On Chicago's Tallest Buildings?